Don’t want to deal with the hassles of packing and shipping your Kickstarter orders to backers around the world? Let eFulfillment Service help. 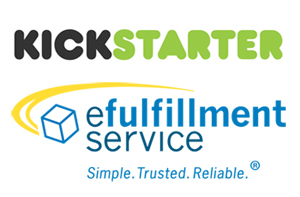 eFulfillment Service (EFS) is the trusted name in crowdfund order fulfillment. We provide Kickstarters and other crowdfunders with the speed and flexibility needed for a wide range of products and campaigns. We can ship just your Kickstarter orders, or we can help with your ongoing fulfillment needs as well. Click here for a free quote for shipping your Kickstarter or other crowdfunded orders. Why Choose Our Fulfillment Center for Your Kickstarter Shipping Needs? Outsourcing order fulfillment is a big deal. After all, it means giving up some of the control you have over your business. And when you’re trying to leave a positive impression on those that are helping to fund the growth of your business…your brand advocates, you might say…it’s an even bigger deal. Above all else, Kickstarters take comfort knowing that, with eFulfillment Service, they are getting a reliable, experienced partner, one that they can count on to get their new venture started off on the right foot. Shipping pre-orders and rewards to your backers is a bit different than filling your regular, ongoing orders. And, because of that, crowdfunders often have specific questions related to how we will handle their projects. Here are a few of the most common ones…. Can you handle just my Kickstarter rewards and pre-orders? Absolutely! At eFulfillment Service, we always try to be as accommodating as possible, which means that if you’re looking for a short-term engagement that involves us just shipping the rewards to your backers, we can certainly do that. How long will it take to fulfill my Kickstarter orders? This ultimately depends on how many orders we’re processing and shipping, but, on average, it generally takes us 1-3 days to process and ship all of your pre-orders. For fulfillment of your regular, ongoing orders, those will ship out within one business day. No, we do not have any minimum order volume requirements at our fulfillment center for ongoing orders. For Kickstarter or crowdfund orders, we generally want to see a minimum of at least 200 backer orders. So if you have 1,000 pre-orders for us to send out, and then after that you ship 50 orders each month, that is perfectly fine by us and we’ll never penalize you for not reaching a certain order level. Yes, we can ship your rewards and orders to your backers all over the world. How will you receive my Kickstarter orders? We can receive orders 3 different ways. The first way is through direct integration with your shopping cart or sales platform. The second way is by importing a CSV order file into our system, which works well for Kickstarter pre-orders. And the third way is by manually placing orders in our web-based system at any time. Absolutely! Most of our Kickstarter clients ship inventory to our fulfillment center directly from their suppliers. If you need help with getting your products through customs and dealing with duties/taxes, we can help with that, too! Not long. We generally recommend getting your account set up with us at least one week before your inventory arrives at our fulfillment center. And you’re not charged anything until your inventory actually arrives. Each project is unique, so please fill out our quote request form to provide us with a little information on your Kickstarter campaign, and we’ll quickly send over a quote! Whether you’re in the midst of your campaign, or just getting started, we’ve created a guide that offers a few helpful tips on reaching your Kickstarter goal, including advice for setting pledges, creating awareness outside of Kickstarter, keeping your backers in the loop, and more. Click here to view our free guide: 10 Tips for a Successful Kickstarter Campaign.